Flagship TOT AVR shares the same features of the other models in the Torus TOT range but adds automatic voltage regulation and smart ethernet connectivity. Earn 2599 loyalty points when you order this item. The TOT AVR is rated at 4 amps and on top of the toroidal isolation, noise filtering and high instantaneous current capacity shared with the rest of the range, it provides automatic voltage regulation enhancing protection against voltage sags, brownouts and surges. In addition, it includes Smart Ethernet connectivity and RS232 interface ideal for home theatre receivers and 2-channel audio systems. 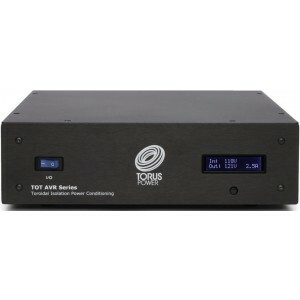 Torus Power’s “TOT” Series consists of three compact models that bring toroidal power conditioning to a new price point. Compact in size, affordable for most applications and packed with features, the TOT Series is an easy choice to improve the performance of all audio and video systems. Compact and competitively priced, the TOT AVR isolation transformer uses Plitron’s ‘LONO’ (Low Noise) transformer design technology, which eliminates audible noise in the power transformer, in tandem with the Company’s Narrow Bandwidth Technology (NBT) noise-filtering technology, to restore incoming power to its clean original state regardless of power-line conditions. Designed for small to medium-sized audio systems, TOT AVR features a large 920 VA isolation transformer and has three sockets on the rear each having a maximum current output of 4A. Torus TOT AVR will keep the output constant within the range of 220 – 240 VAC +/- 10, with an input voltage of 170-270 VAC. TOT models provide a convenient USB-type charger as a bonus feature along with basic circuit protection through a replaceable varistor. Torus Power non-sacrificial Series Mode Surge Suppression (SMSS) is also available as a factory-installed option at a premium (not included as standard). Sorted your Power Supply? Then how about one of these?